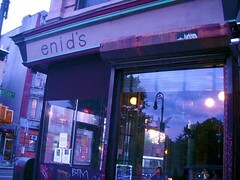 My sister recommended we try Enid’s the other day while I was out visiting her in Brooklyn. She mentioned mac ‘n cheese and outdoor seating where my dog could accompany us, and I was sold. The outdoor seating was comprised of around 6-8 tables bordering along the exterior of one half of the restaurant. I noted as we walked up that it seemed like some of the patrons knew each; it was a nice familiarity you don’t see everywhere in NYC. I’d heard how fabulous their mac ‘n cheese was, so I knew that was a must-have. I skimmed the menu and zoomed in on the blackened catfish sandwich. 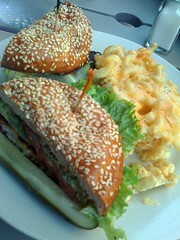 It was $12, but the menu noted it was prepared with a dill remoulade, jalapeno slices, and included a choice of a side. The mac ‘n cheese side was available, even though purchasing it alone cost $6.50. My $12 “combo” seemed like a steal. Other options for sides included collard greens, spicy pickled beets, coleslaw, fries, or a salad. When my food came out, I knew it was going to be good. The catfish was blackened to just the right degree. Paired with the jalapeno slices, it had the perfect amount of zing which the cool dill remoulade counterbalanced. The mac ‘n cheese looked like comfort food’s answer to lasagna. I don’t know if I could ever go back and not go for it again (… and again). Plus, one of their seasonal side options was a biscuit. Not perhaps the most logical option to pair with catfish and mac ‘n cheese, but I can attest they were some of the best biscuits I’ve had in the city – even moreso since they served it with butter and honey. The only thing which would have made it better would have been if the honey had been replaced by Yellow Label… Highly recommend! For you Manhattan-centric eaters, it’s definitely worth expanding your horizons in order to give it a try.